This last week I finally started on the next major project; a (much requested) new dinning table. We are currently using the small square table that came with our old condo. It is a 28×28 table done in the Chinese style (I assume it was built in Hong Kong along with the other pieces in the same wood type) and while I am a big fan of this style of furniture, a frame and panel table top really does not make sense for a dinning table, especially with small kids. Not to mention the fact that it is really too small for 4 people to eat a meal at. 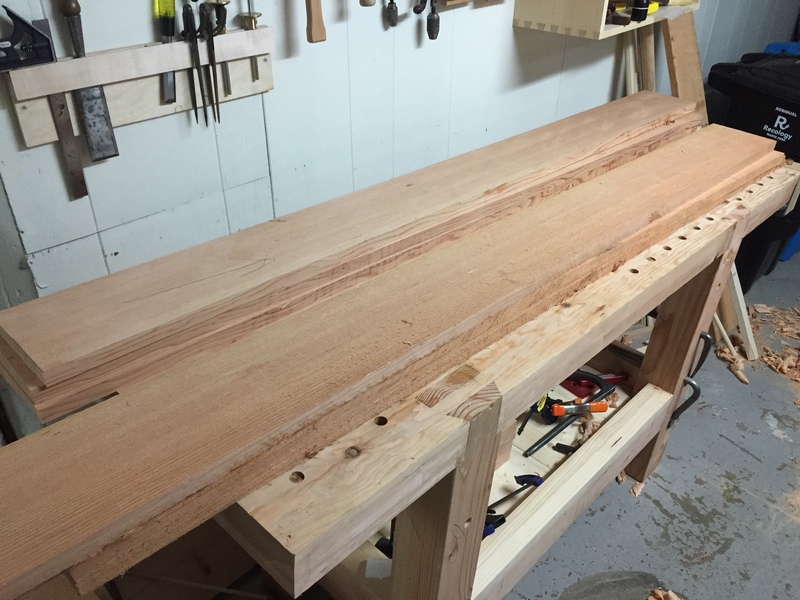 The plan is to build a version of Chris Schwarz’s American Trestle Table with a slightly wider top (one of his comments in a blog post mentioned that 36 inches would not be a problem with the design). So after setting up some saw horses and planks in the dinning room to confirm that the dimensions work it was time to pick wood for the top. 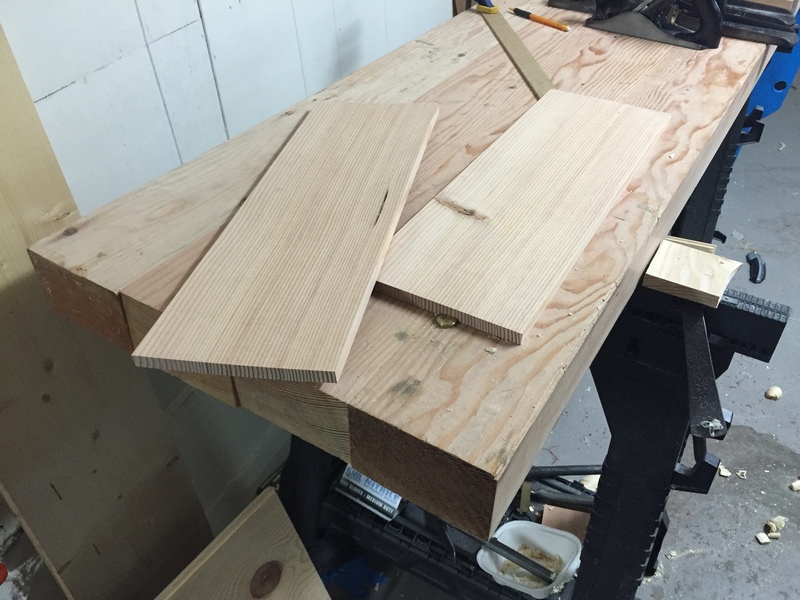 After digging through my pile of rough Douglas Fir I decided that there are enough clear boards to make the top though a few will need some long rips to remove edge knots or sap wood. 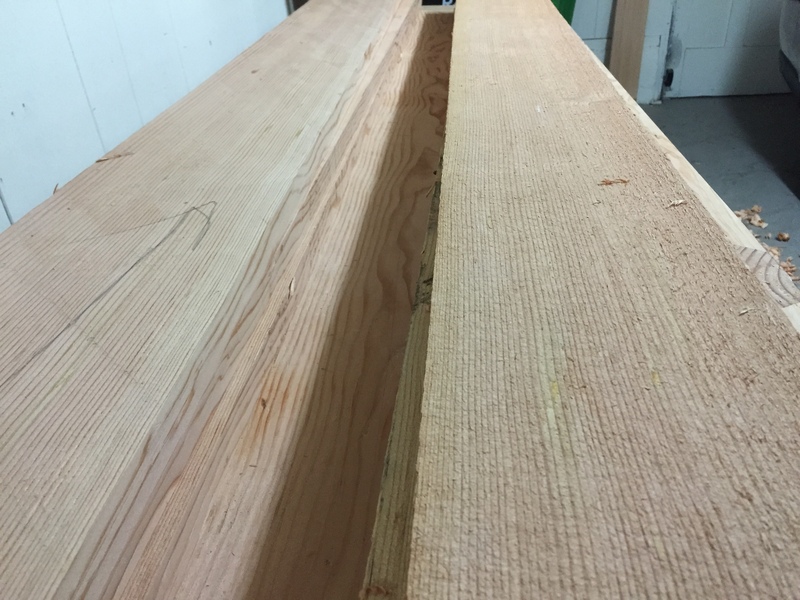 I am not sure how well an inch thick Douglas Fir top will hold up but I can always replace it with a hardwood top at a later date (after the kids are older). 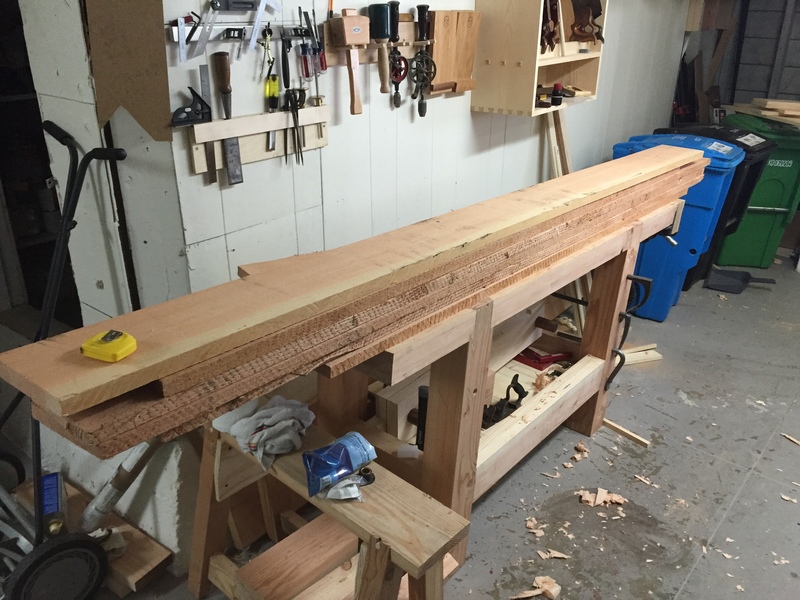 I rough cut the selected boards down to 80 inches long , making sure to cut a couple of inches off of the end before measuring. 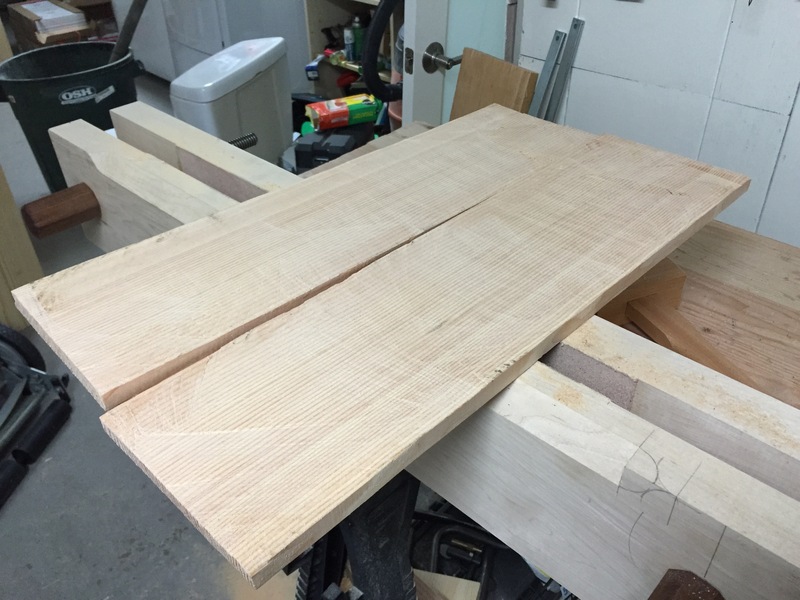 While 80 inches is the target length of the table there will be bread board ends that will add some length. 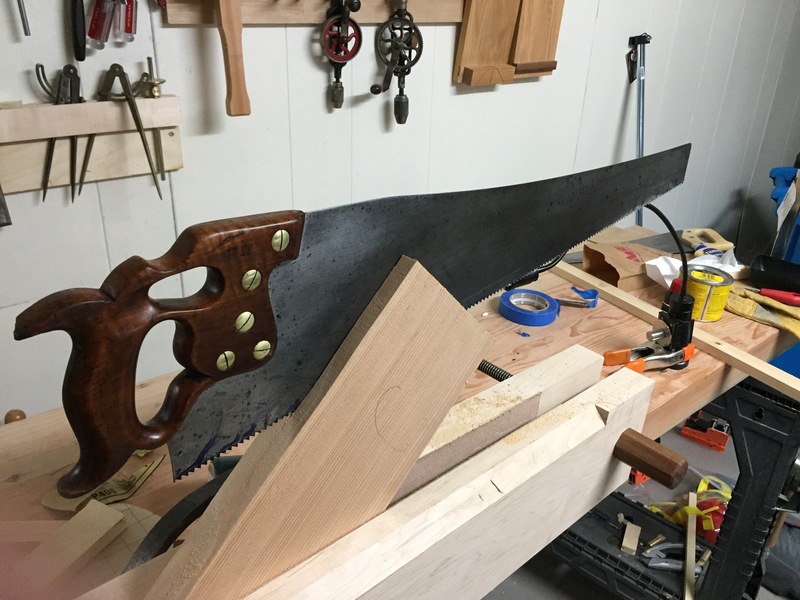 Over the weekend I used a combination of by #6 (which has a cambered blade) and my #7 to flatten the surface enough to get an idea of the grain pattern and direction. It looks like one more board (three total) will need to be ripped down to remove a split and one has a knot I missed in the initial inspection that does not appear to be a problem on one side. Later this week (or more likely next weekend) I will set up my mini band saw and rip them down. Milling: the act of taking a pile of lumber and turning it into a slightly smaller pile of lumber. For once, I blamed the tool and was actually right. 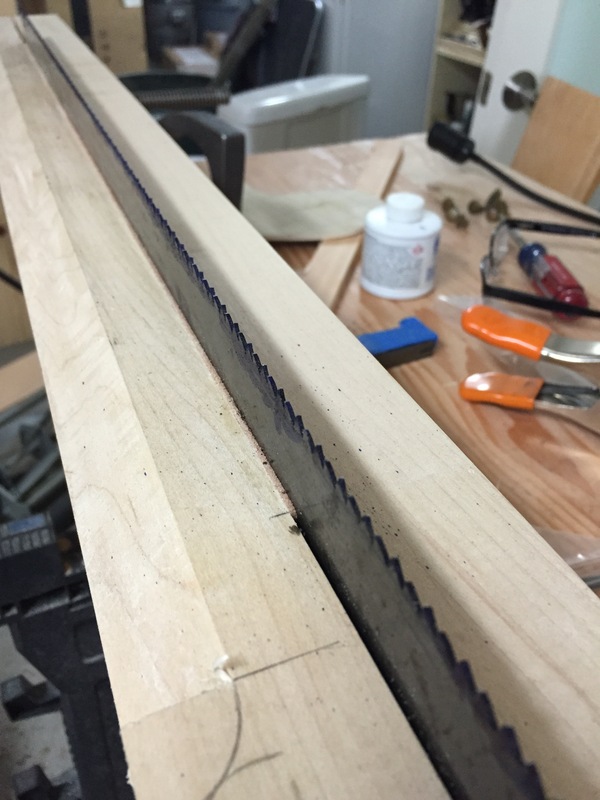 Those of you who read my resawing post saw the mess I made using a modern disposable saw. 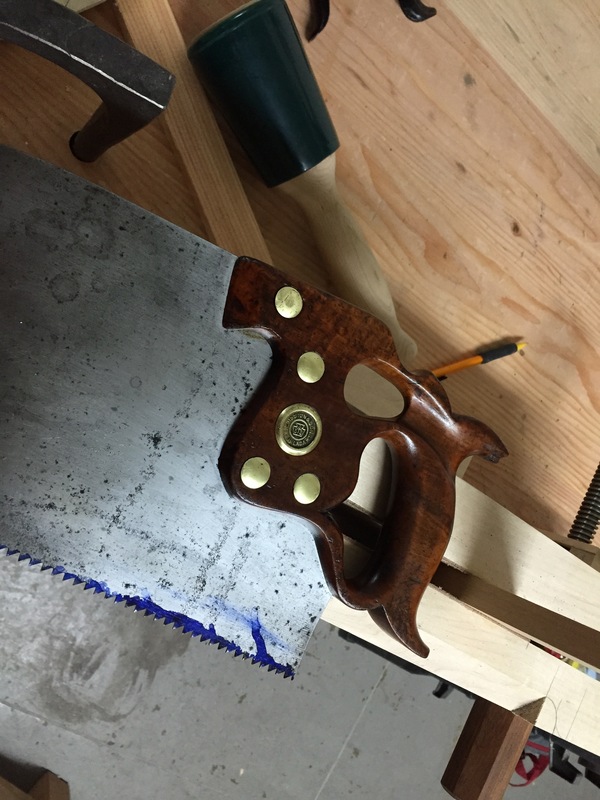 As a result, on Saturday I decided to sharpen my Disston D8 rip saw. 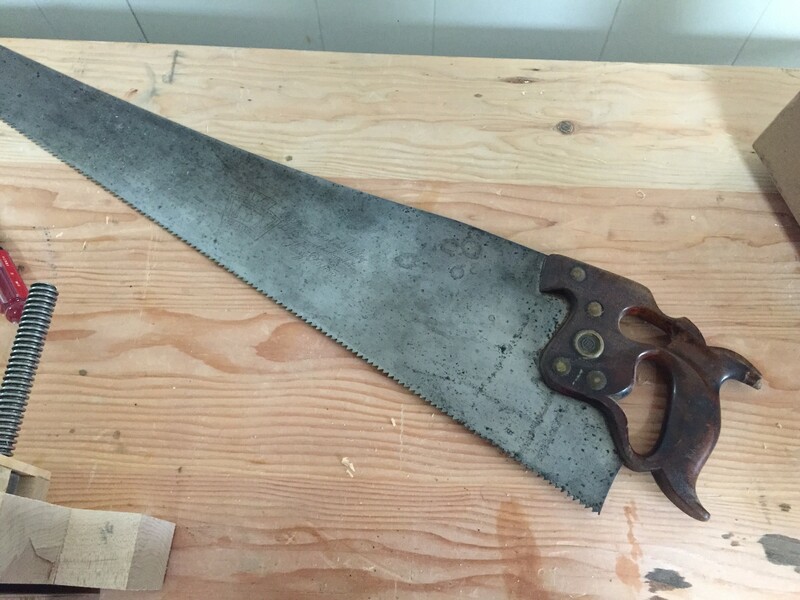 I acquired this saw from the same collector I bought Big Bertha from and according to the Disstonian Institute medallion directory it was manufactured between 1895 and 1917 meaning it is likely around the same age as our house. It has around 5.5 TPI and is dull as a hammer but the previous owner had removed the visible rust. 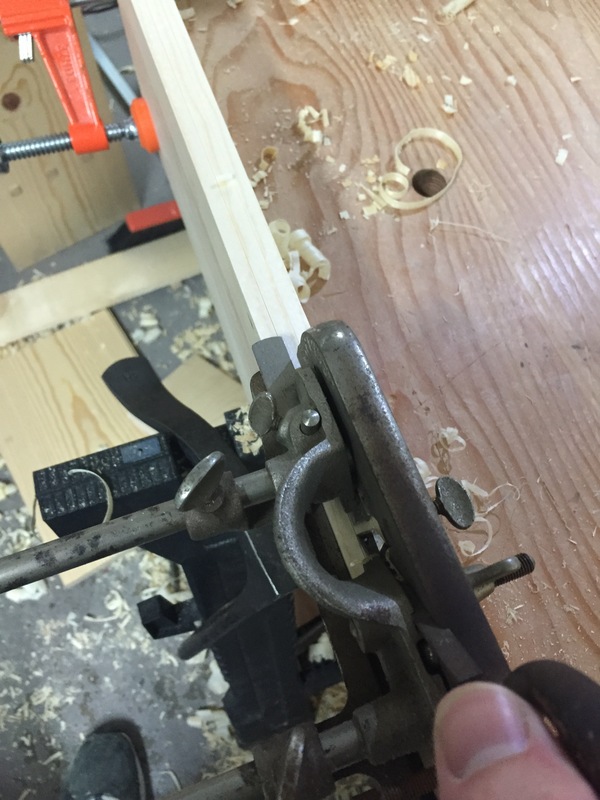 I made my Moxon vise large enough to hold a full size saw plate (though the leather is about 2 inches short) so I removed the handle and placed it in the vise and followed the sharpening method described in the Heritage School of Woodworking video. After two rounds of jointing and shaping I checked the tooth set (it was more than I needed) and then did a final sharpening pass with my 7 slim taper file. A few passes with a medium and fine rust eraser removed the rust and grime than had been hidden under the handle. The handle was sanded with 220 and 320 then was wet sanded with BLO and 400 grit paper. I left a bit of the old patina and the BLO showed a bit of curly Apple which was a nice surprise. Two coats of spray shellac and a coat of wax left a nice surface. The brass was sanded, buffed with steel wool and waxed. If you will remember, after an hour with the disposable saw I had made very little progress resawing the board and the progress I did make was a mess. After my son went to bed I waxed the handle, cleaned the brass, reassembled the and finished splitting the board. All told I was done in hour, so it was the tool that made the difference. It saw amazingly easy to follow my marked lines and the saw actually stay within the defined saw kerfs, something the modern saw refused to do (I suspect it is due to the hybrid teeth and large set). 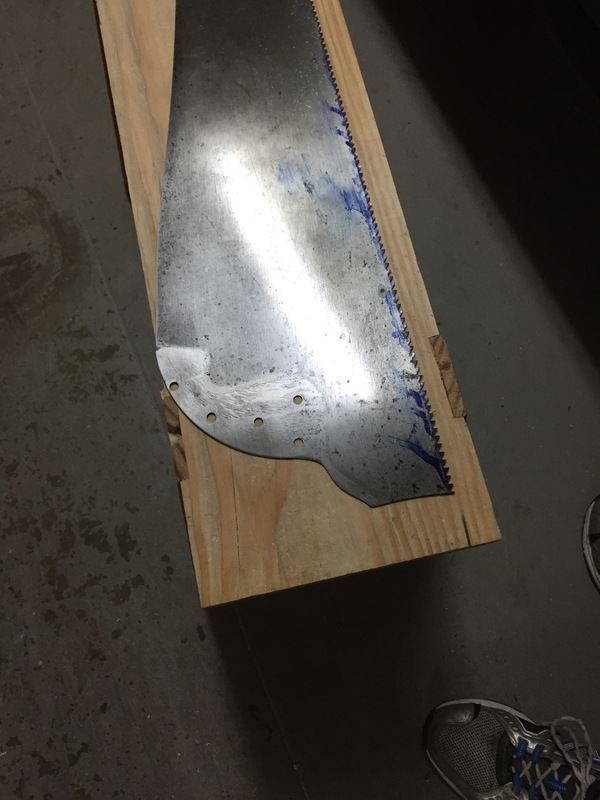 The Results were not to shabby though the ends that were started with the new saw were a mangled mess, luckily I was able to cut most of the bad parts off and smooth up the remaining marks with my number 6. 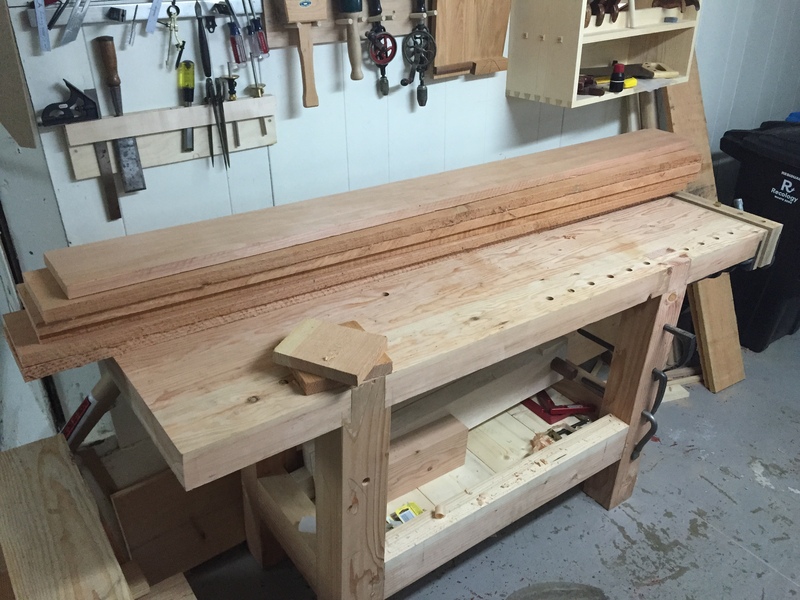 Now that the main joinery is complete it is time to focus on betting the back built. There are three primary horizontal panels which are ¾ inch thick; one in the drawer compartment and two in the upper area. 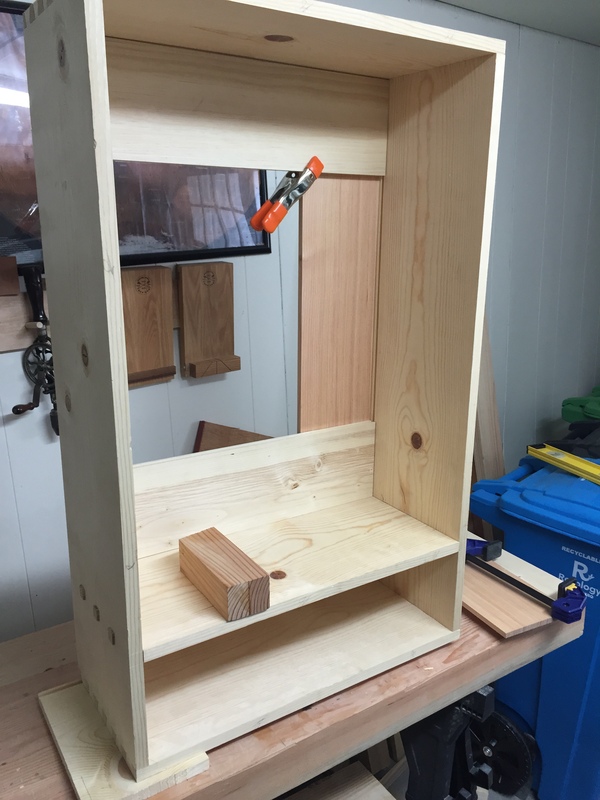 The two upper pieces will have three vertical dividers which will have quarter inch panels between them. 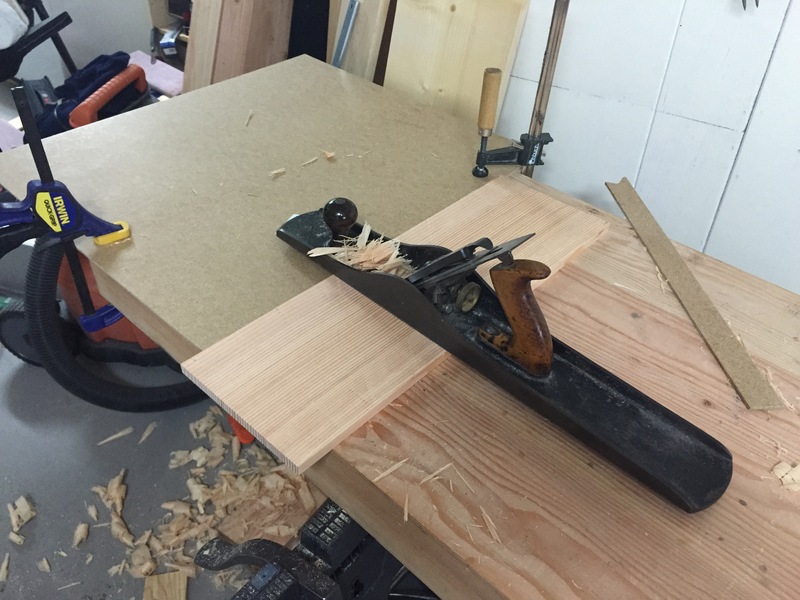 I used the Stanly 45 with a spur to rough out the tenons and then refined it with my shoulder plane. 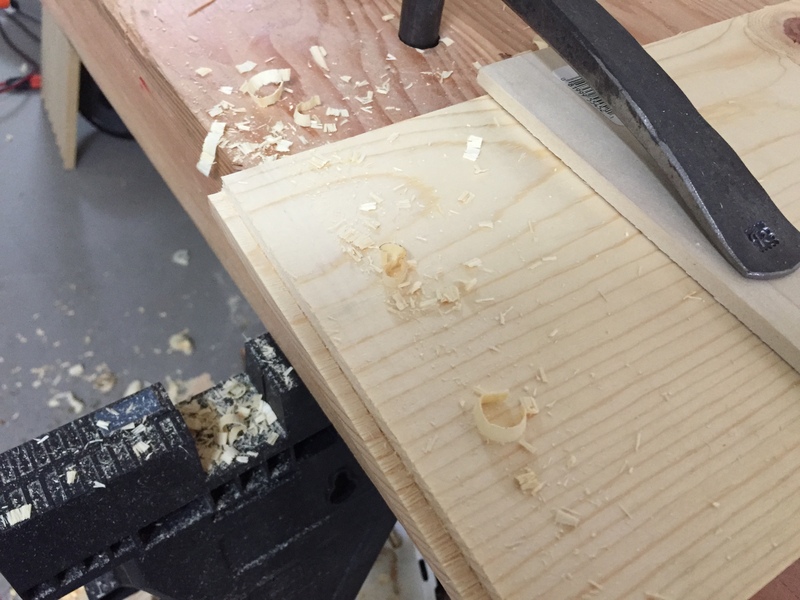 For the corresponding grooves I used a small plow plane. Since I am using two separate planes I can swap back and forth. Unfortunately for the top piece the fence shifted on me and I had to plane the edge flat again which made it smaller than planned. For the thin panels I am using some SVG Douglas Fir I have had air drying for quite some time. Some months ago I picked up a 1X12 at the local hardware store which had some tight grain lines and the pith was off to one side. 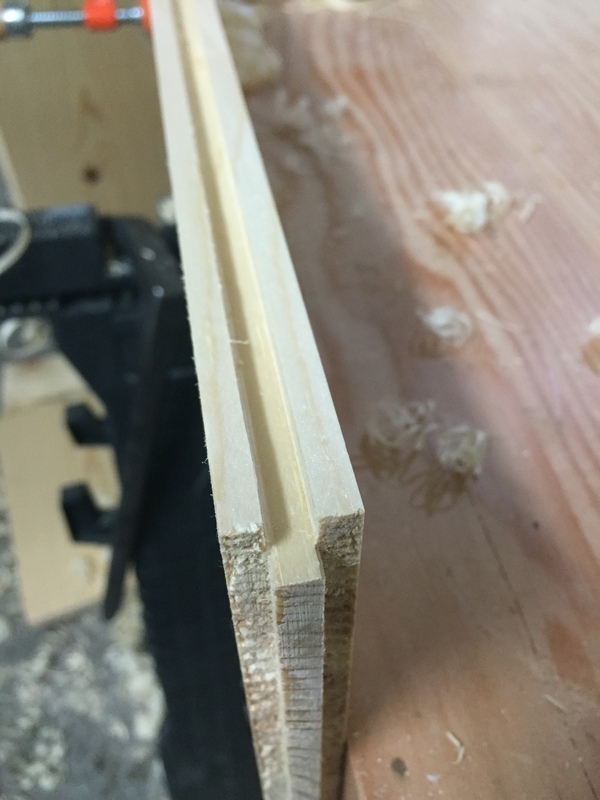 I jointed the boards and chopped out usable sections around some large knots and I ran a smaller section through the band saw and planner back when I had a tech shop membership. Unfortunately, these panels cupped a bit as they finished drying so some cross planning with a #7 and #6 was necessary. Air dried Douglas Fir planes beautifully and has a lovely pinkish huge. This week I will start gluing up parts of the main casing in the evening. 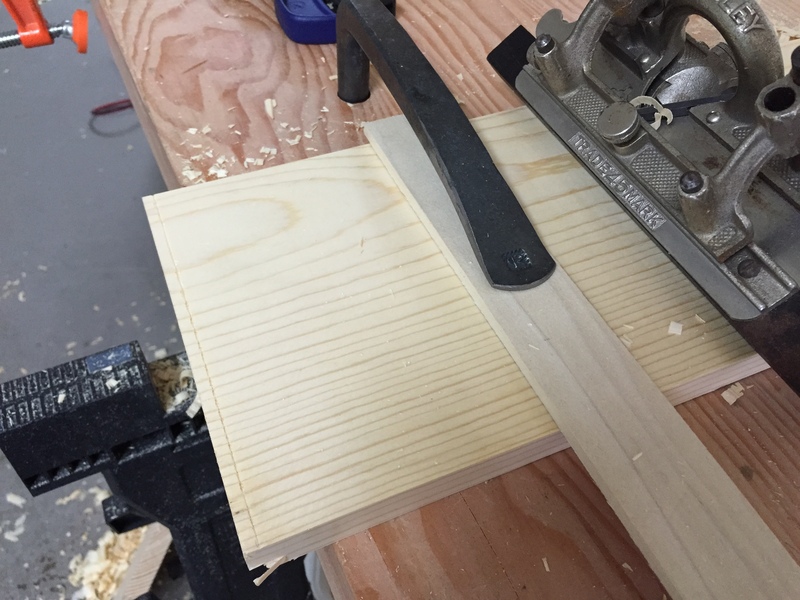 I have a limited number of clamps so it will be easier to spread out the glue up.